“The golden age of science fiction” is a term used to describe a particularly fertile period in science fiction, when old conventions of “the space western” were challenged with new ideas, new themes, and new energy. 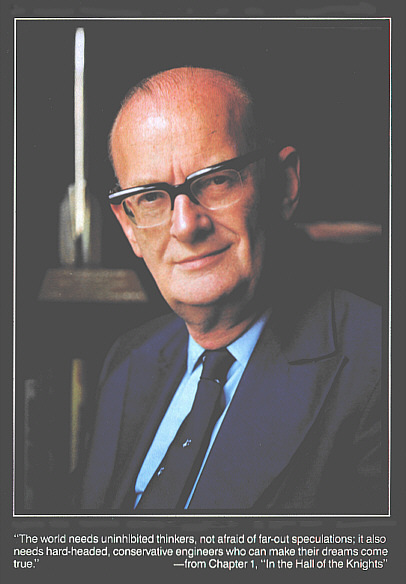 There are many names associated with that period—Heinlein Bradbury and Asimov, among others—but no name is more synonymous with that heady time in science fiction than Arthur C. Clarke. The death of Clarke, yesterday at his Sri Lanka home at the age of 90, almost closes that chapter of science-fiction history. With only Ray Bradbury left from the shiniest nuggets of the Golden Age, more than just writers are passing into history… the very ethic that created the world we live in today is slowing growing pale. Clarke was an exceptional, prolific writer, of that there is no doubt. The impact of his work is felt across society today. Beyond the obvious influence of his seminal work, “2001: A Space Odyssey,” Clarke’s writing and thought has altered today’s world in general. The most scientific of the golden age writers (Asimov and Heinlein were more concerned with plot and character interaction, while someone like Bradbury was more interested in sociological themes), Clarke was a true product of the age of the science and reason that blossomed after WWII. Well trained and highly intelligent, Clarke envisioned much of the world we see around us today through prose and his ideas. One of the problems with writing science fiction is that prediction is a doosy. There are so many possibilities with the future that finding the one that WILL occur is a devil of a task. But science fiction is as much about what is possible as it is about what will be, and in that area, Clarke was phenomenal. He adhered to scientific principles very rigorously in his writing, even in those books that tended to explore more esoteric areas of the human psyche, such as “Childhood’s End,” and “The City and the Stars.” While many of the predictions Clarke wrote of never came to pass—or occurred differently than he envisioned—more than any other writer of the period, what Clarke wrote was ALWAYS eminently possible. In fact, Clarke is partially credited with perhaps the most important innovation in our current world, the communications strategy. While ideas for satellites in geosynchronous orbit (and communicating with them) had been in play for sometime, Clarke’s 1945 paper titled “Extra-Terrestrial Relays” and published in Wireless World was the first article to describe—in detail—the idea of using geosynchronous satellites as telecom relays. Other people were thinking about the same things at the same time, but it was Clarke who first put the idea into a usable form, and who first described the science required to make it tangible. Despite claims of other men filling the role, Clarke’s supposed position as the father of modern telecommunications is strengthened by the fact that the United States patent board used his essay as an example of “prior art” in denying patents to the people who made the first functional communications satellites. But beyond the big things, like the seminal novels and the rigorous scientific foundation for his work, Clarke’s work was, first and foremost, intended to be read. For science fiction fans of my generation at least, the first introduction to science fiction was usually in the tender hands of Clarke. Easy to read, yet intellectually complex, Clarke’s prose draws the reader into narrative in a way few other writers can match. For me, the book that converted my fantasy addiction to an science fiction addiction in my early teens, was “Childhood’s End,” a classic example of Clarke at his best. I remember being extremely interested in the story, and I felt almost compelled to turn each page. I finished the entire book in one sitting, reading late into the night under my covers with a flashlight. After reading Clarke’s stunning ideas and fascinating nuances, the fantasy I had been reading seemed horribly formulaic and unoriginal. With a few notable exceptions, I’ve rarely looked back since then. Today, the world is without one of the major visionaries of the latter 20th century. The golden age of science fiction went hand in hand with the golden age of science after WWII, and Clarke, along with his contemporaries, was right in the middle of it all, commenting on current events and speculating about our future. And more than any of his contemporaries, Clarke’s ethic served as both a sounding board and a driving force behind making his envisioned-future happen. He will be sorely missed. Fortunately, through his words, he has left us a great legacy. ET? We don't need to talk to ET. We need to talk to God. Because IF ET actually does exist, he's going to want to talk to God too. ET? We don’t need to talk to ET. We need to talk to God. Because IF ET actually does exist, he’s going to want to talk to God too. The odds on ET are shorter than the odds of God. We at least have a mathematical equation that describes how to work out the odds of ET's existence, though we don't know how to quantify some of the terms at the moment. As for God, we don't even have an equation there, never mind quantification of the terms. I think your statement works better the other way around … IF God exists, ET will probably be curious about Her. The odds on ET are shorter than the odds of God. We at least have a mathematical equation that describes how to work out the odds of ET’s existence, though we don’t know how to quantify some of the terms at the moment. As for God, we don’t even have an equation there, never mind quantification of the terms. I think your statement works better the other way around … IF God exists, ET will probably be curious about Her. "The odds"? Pardon the internet jargon, but LMAO! There's more to life than empirical equations, bud. Btw… IF ET exists, God will have some explaining about why HE didn't let us know about him sooner. “The odds”? Pardon the internet jargon, but LMAO! There’s more to life than empirical equations, bud. Btw… IF ET exists, God will have some explaining about why HE didn’t let us know about him sooner. "Is God obligated to tell man everything?" Of course not. “Is God obligated to tell man everything?” Of course not. So then, why would he have any explaining to do about extra-terrestrials?